I’m finally getting back to restaurant reviews. I have been so busy as of late that I’ve been skipping these important reviews both locally and when I travel. And that is stopping…as of now. I made a promise to be better about updating my blog, and, by God, I’m going to stick to it. So…I have the pleasure of being friends with some amazing people who just happen to be foodies! And…they seem to be as excited about trying different places around town as I am. And that…means LOTS of fun trying out new places with good people who aren’t afraid to be honest and outgoing. Being a foodie is fun. While I have my favorite places here in Louisville, some great new places have moved in and opened up. And one of those places is Pho Ba Luu, in Butchertown. Pho Ba Luu, as my can probably guess, serves Saigon Street Food. Think the obvious pho…in addition to rice bowls, banh mi sandwiches, as well as rice bowls. As I tend to do when I am going to new restaurants, I contacted them to find out if I, being a Celiac and vegetarian, could eat anything there. Jessica Mach e-mailed me back and let me know exactly what was safe for me. All the pho bowls, by the way, are gluten free. Just don’t get the hoisin sauce. The spring rolls are also safe…and they offer gluten-free soy sauce as well. The staff was INCREDIBLY knowledgeable too after we visited and placed our order. So…bit shout-out for those, who like me, have food allergies and intolerances and need a little extra care at restaurants. So…four foodies drove into Butchertown specifically for some Vietnamese food. And, let me tell you, there were some high standards to be met. Paul is actually part Vietnamese and his wife, Melissa and he actually have had street food in Vietnam. They actually ordered first. Paul got the Chicken Pho ($10) and Chicken Spring Rolls ($5) for his dinner. Melissa ordered the Chicken Pho ($10…because it doesn’t change…LOL!) and the Shrimp Spring Rolls ($5). They each also ordered the Iced Vietnamese Coffee ($5), which I want to try next time because it looked AMAZING! It’s happening. Cathy (that’s the roomie, in case you are new to the blog or have forgotten during my hiatus on reviews) decided to go all meaty and gluten-y since she doesn’t get that at home. She ordered the Beef Pho ($11) with the Seafood & Pork Crispy Rolls ($6). I may get asked…maybe not…but in case…the Seafood & Pork Crispy Rolls were crispy rolls stuffed with shrimp, pork, crabmeat, onion and vegetables and is served with a fish sauce. So that’s for all of you non-vegetarian/vegan gluten eaters out there! She’s got your back! As for me…I ordered the Vegetarian Pho ($10) with the Vegetarian Spring Rolls ($5). The spring rolls are normally served with a Plum Sauce, but as I noted gluten-free at the order, they brought me gluten free soy sauce instead. Let me say this…the four of us are already discussing going back next Friday to celebrate Tet (the Vietnamese New Year) this coming week. Not. Even. Joking. Because when it comes to good food…I don’t make those kinds of jokes. So…here’s the run-down from what I was devouring last night. I’ll start with the spring rolls. The Vegetarian Spring Rolls are basic fried tofu with sauteed vegetables and glass noodles wrapped in rice paper. They looked fantastic. They tasted phenomenal. The gluten-free soy sauce was the perfect touch. I love spring rolls as it is…these were some of the best I have had. And that’s no exaggeration. They are simple…but they bring the flavor and the textures just all worked. But, of course , the star of the Vietnamese Food scene last night…was the Pho!! First of all…the bowls are pretty big and we all had another meal’s worth left over after dining last night. No joke. Hey…it meant we had lunch today. So…be aware that there is a LOT of volume in these bowls. The Vegetarian Pho has sauteed tofu and vegetables in a vegetable broth. You get a little baggie of all the add-in goodies…like bean sprouts, jalapenos, and the like. I poured them all in. I added a good helping of Sriracha. And once I was done with my Spring Rolls…in went the remaining gluten-free soy sauce. FLAVOR!! That’s all I can say. The broth had amazing flavor as it was. The tofu and vegeatlbes…they brought extra goodness to the party. The carrots still had some crisp to them. The tofu was savory and soft and just…done to perfection. The add-ins brought a little more spice…a little more texture…a little more yumminess to an already yummy situation. I was in love and I managed to not splash myself with anything as I ate the noodles with chopsticks and slurped up that broth with the spoon. This gluten-free vegetarian loved every bit of the meal last night. And I think my partners in street food would agree. Cathy loved the Beef Pho and her Crispy Spring Rolls. While she does like spring rolls, she LOVED the crispy rolls. I think she will never NOT get those. The beef finished up cooking in the hot broth when it was delivered to the table and after she sorted out the jalapenos to both Paul and I from her bag of goodies…she was all in. And loving in! And my Chicken Pho eaters…they were quite content with their bowls too. They seriously raved about the flavor and I believe they even said it came very close to the street food they had in Vietnam. So…there it is. OH…and Melissa highly recommends the Iced Vietnamese Coffee. She got two of them last night if that tells you anything!! The Chicken Spring Rolls & Shrimp Spring Rolls disappeared as quickly as my Vegetarian ones. Any way you slice it…we loved everything we ate here. Yeah…I went there. I can’t help myself sometimes!! So…anytime I get to eat a big bowl of pho without having any reaction to it because everyone who works there made sure my food was safe and perfect…gets many return visits from me. I can’t wait to go back. And…for the record…they have a Gluten Free Apple Pie ($6)…that we were all too full to try…but we may have to get it next time and split it among us. Because…dessert is very important to me. Special shout-out again to Jessica Mach for answering my e-mails when I inquired and helping me navigate the menu without any trouble at all. If you are in the Louisville area or are coming to Louisville, Kentucky, and love or want to try Vietnamese food…I can’t speak highly enough of Pho Ba Luu. People with food allergies…welcome…and taken care of. I call that winning! Growing up, I often cherished the smaller, simpler things in life. Like…drinking soda at Grandma and Grandpa’s house…because they let us have an entire can instead of splitting it three ways between us. Or…being treated to pre-dinner cookies while at the lake cabin with my grandparents (grandparents are the best!). This often meant Pecan Sandies or…Nilla Wafers. Yep…I blame my absolute love of Nilla wafers on my grandma. My grandma LOVED her sweets (I come by it honestly), and while she was very much a chocolate lover…she always seemed to have a box of Nilla Wafers at the lake or in her pantry at home. Without fail. And if we looked like we needed or wanted a snack…Nilla Wafers were it. Already a big cookie monster (yeah…you know I am! )…I haven’t had Nilla Wafers in a long time. And when I was diagnosed as a Celiac…they were gone for good. Or…so I thought! One afternoon, while walking the aisles at my local Meijer, I dropped into the gluten-free section just to see if there was anything new or interesting. Turned out…there was! The image on the box had the buttery looking rounds that I remembered from my childhood. And so…a box traveled from store to pantry just like that. And in my head…I had it all planned out. I was going to make a banana cream pie with them. How great would that be?! Except…I’m not the biggest fan of pie…so that aspiration sort of fell to the wayside and this box sort of just…sat on a shelf. And cookies should never just sit on a shelf. Tonight, that all changed. With the banana cream pie out of the question now…I thought, “Hey…I used to eat these things straight up, right out of the box…why should that have to change?” The answer: It doesn’t. And tonight…it didn’t. After wrapping up an amazing dinner of Texas Queso-dillas (vegan, gluten-free noms! ), I did up the dishes and retrieved this box from the pantry shelf. The time had come. And I had high hopes that these would bring back all those feels from my childhood. I dished up a serving to my roomie and a serving to me…and as we finished up The Muppets episode that we missed…we noshed. She never was into Nilla Wafers (because she’s weird), so she thought these were “pretty good.” *sigh* She doesn’t know something amazing when she bites into it. These cookies were beyond fantastic. 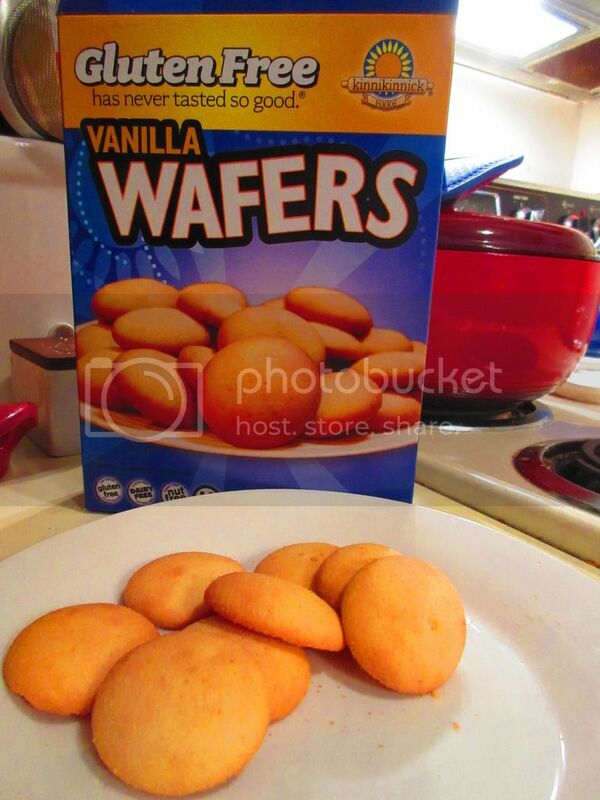 Every happy moment from grandma’s house involving Nilla Wafers came rushing back to me when I bit into my first Kinnikinnick Gluten Free Vanilla Wafer. The taste was sweet and vanilla-y. The cookie had that soft center and that golden outside, that wasn’t crunchy, but wasn’t just chewy either. It was the full-out, real-deal, fantastic gluten-free interpretation of a childhood favorite. And if I didn’t portion out these things before settling in to eat, I probably would have devoured the entire box. Kinnikinnick has been awesome about bringing back childhood favorites…like graham crackers (S’moreables…HELLO S’MORES! ), and Oreos (KinniTOOS), and pumpkin spice donuts (I haven’t actually found these yet…), and BLUEBERRY bagels (which have been reformulated, so while I didn’t LOVE them back when I began this gluten-free journey…a revisit might be happening). I haven’t found any other gluten-free company turning out childhood classics that are SO close to the real thing that it actually makes you double-check the box. Yep…Kinnikinnick has definitely won my heart over once again. And all it took was these little vanilla cookies. Because this, my dear friends…this was my childhood! Let’s discuss the ingredients that go into Kinnikinnick’s Gluten Free Vanilla Wafers! These cookies are made from cane sugar, water, potato starch, white rice flour, non-hydrogenated palm oil shortening (palm oil, modified palm oil), pea starch, tapioca starch, egg whites, cellulose powder, tapioca syrup, pure vanilla extract, salt, cellulose, baking powder (sodium acid pyrophosphate, sodium bicarbonate, pea starch, mono calcium phosphate), sunflower lecithin, natural colour, and natural flavor. This product is gluten free, dairy free, nut free, and are kosher. These cookies are also free of soy, sulphites, mustard, fish/shellfish, sesame, corn, and yeast. As for nutritional information, the Kinnikinnick Gluten Free Vanilla Wafers are cookies and a treat. So…remember that. A serving is 8 wafers (36 grams) and there are about 5 servings per box. You will be chowing down on 160 calories, 5 grams fat, 2.5 grams saturated fat, 0 grams trans fat, 0 mg cholesterol, 150 mg sodium, 27 grams carbohydrates, 2 grams fiber, 12 grams sugar, and 1 gram of protein. I love that they are bite-size cookies that give you a treat without really feeling guilty about it. Their vanilla sweetness is just enough to satisfy without being too sugary sweet. LOVE that balance. So, yeah…the great pantry clean-out is on. And these are the last remaining cookies in there. I am sort of sad to polish these off and move onto something else…but now that I know where to buy these, you better believe they’ll be an every-now-and-again treat. And, who knows…maybe I will get around to making that banana cream pie someday. I am so excited. And the reason why is simple. I have found the meat replacement, Neat, at a few of my local stores. My Kroger, my Meijer, and even a few of my natural food stores now carry these little pouches of meat replacement goodness. Now, mind you, I’m not one who often will replace meat in a dish. I usually will use something like tofu or mushrooms instead, but there are some recipes (from my childhood, especially!) that just call for using an actual meat replacement. I have a few go-to brands that are gluten-free as well as either vegetarian or vegan. But ever since I received a pouch of the Mexican Mix from Neat in my Cuisine Cube back in October, I was hooked. I just had nowhere in this area to purchase it on my own. Up until yesterday, my pantry held the Italian Mix and the Original Mix. I’m using a few things up in my pantry (I have a bit of an overstock, HA! ), so I decided I would go ahead and bake up some of the Moon Rabbit Foods pie crusts that I had from another Cuisine Cube. I could freeze two of them, and then give using the third one a shot in an old family favorite, which I would adjust to make gluten-free, dairy-free, and vegetarian. With a pie crust baked up…it was time to make the filling. As I was using my mom’s recipe, I began to brown the sweet onion while I mixed up the ingredients for the Neat Original Mix. This is really easy. Simply empty the Neat mix into a bowl, add two eggs (or egg substitute) and 2 tablespoons of water. Mix well. Once the onions had began to soften, I added the neat mixture and cooked it on medium heat for about 7-10 minutes, chopping at it as one would with regular ground beef. It looked and smelled perfect. 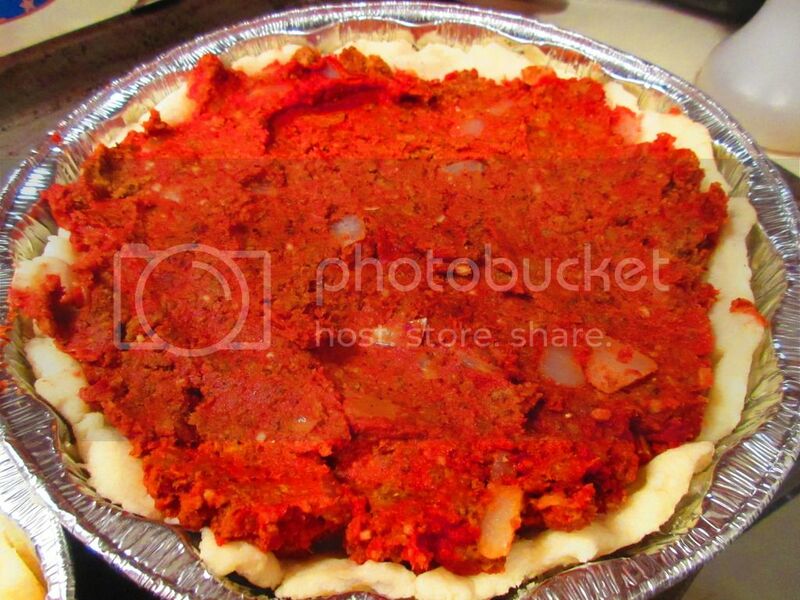 I added the tomato paste, cooked it a few moments longer and then put it all in the pie crust. On went the topping of Daiya cheese and…into the oven it went. Before I talk more about the original mix, let me tell you a bit about Neat. 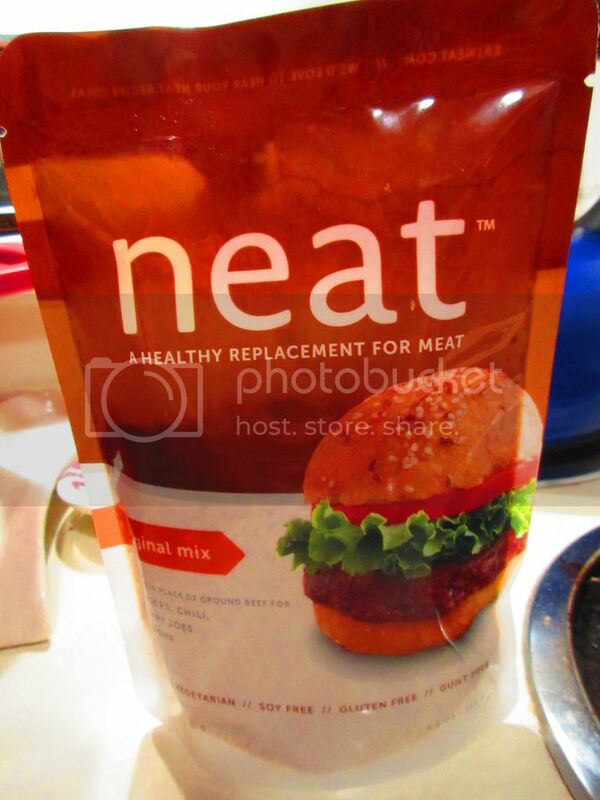 Neat is a meat replacement that is derived from nuts and other non-GMO natural ingredients. It is a product that was created by a mother of two children who decided that they were going to become vegetarians. At first she would puree beans into sauces to help her girls get the protein they wanted, but after awhile, everyone got tired of it. And that was when she got into the kitchen, experimented, and created what is now marketed at Neat. Neat comes in this shelf-stable pouch in a powdered form. All you do to prepare it is pour the pouch into a bowl, add two eggs (or a vegan egg replacer), plus two tablespoons of water. Then, you just cook it in a skillet, as you would ground beef, for about 7-9 minutes. It’s really easy…and really delicious too. 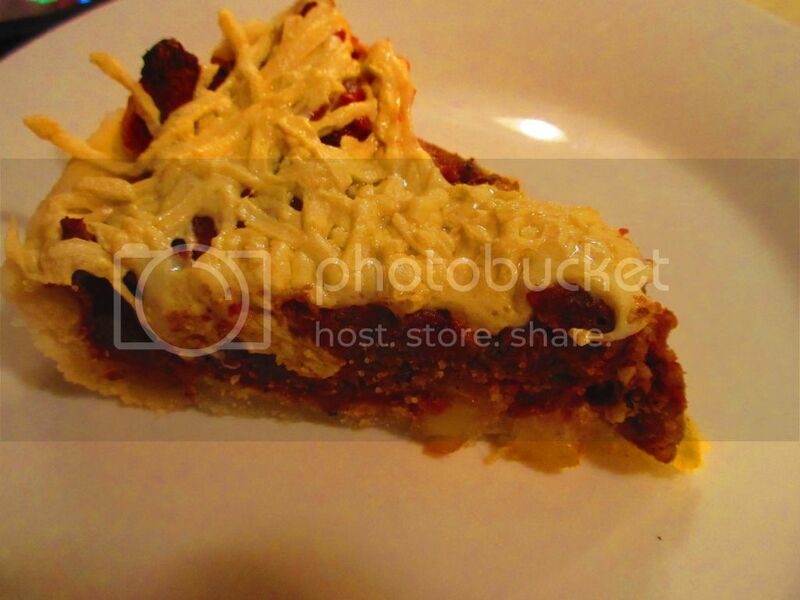 So, a vegetarian and gluten-free Cheeseburger Pie…that was what this was used for. When I sliced through the pie crust and the filling, I was just anticipating the crumbling and falling apart. But Neat surprised me. Much like my mom’s recipe (which used real meat as I wasn’t a vegetarian at that point), this all stuck together and made for a perfect slice. The Neat seemed to be the meat replacement I was looking for. And it was the perfect choice for this recipe for sure. I dished up two slices of the Gluten-Free and Vegetarian Cheeseburger Pie and handed one to my roommate and settled in with mine. My roommate took the first bite and said that it tasted dead-up like a cheeseburger. That’s good. She’s not a vegetarian, nor is she dairy-free or gluten-free like me. But this impressed her. It impressed her a lot. The most disappointing aspect of the dish was the pie crust and that was a whole unrelated product, and it still worked out well in the end. The Neat Original Mix is fantastic. I mean, it is so close to the real thing. As I said, I don’t often do meat replacements, but sometimes when revisiting old recipes I grew up with, it is necessary. I don’t think any other replacement for beef will come close to what Neat does for these dishes. This is the second time I have used a Neat product and both times I have been beyond impressed. The taste and texture are phenomenal. Even meat eaters won’t realize they aren’t really eating meat. That’s the wonder and the glory of this product. Anyone can have it (unless they have a nut allergy) and enjoy it. It was, for the second time, love at first bite. And it was wonderful to be able to adapt an old family favorite to fit my dietary needs. Let’s now take a look at what goes into the Neat Original Mix. This product is made up of pecans, garbanzo beans, gluten free whole grain oats, organic whole grain gluten free cornmeal, garlic, onion, sea salt and spices. Simple. Delicious. Clean eating! It is gluten-free, non-GMO, and kosher. As for nutrition, the Neat Original Mix is a powerhouse. A serving is 40 grams and there are 4 servings per pouch. One serving will provide 190 calories and 15 grams of fat. You will also be getting 232 mg sodium, 11 grams carbohydrates, 2 grams of sugar, 4 grams fiber, and 4 grams of protein. It is filling, so it makes a fantastic substitute for meat. But there is that added bonus of protein from the nuts that are blended into the mix. Pour the Neat – A Healthy Replacement For Meat Original Mix into a medium bowl. Add two eggs (or egg replacer if vegan) and 2 tablespoons of water. Mix well. In a non-stick skillet over medium heat, brown the Next Mexican Mix and onion. Cook until vegetables begin to soften and the Neat can be chopped into a meat texture. Add the tomato paste and stir well. Allow it to heat through for a few minutes to marry the flavors together. 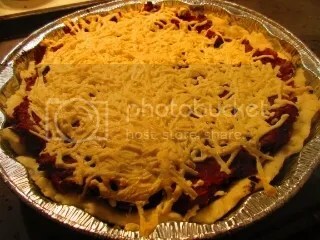 Pour the mixture into the prepared pie crust and top with 2 cups of Daiya cheese shreds. Bake in the oven for 20-25 minutes, until cheese is melted and pie crust is browned (with any luck). Slice and serve. I have fallen head-over-heels for Neat. It is, without a doubt, the healthiest replacement of meat out on the market. I am thrilled that it is more available in my area. In fact, with so many places carrying it, I’m guaranteed to be able to pick it up at one place or another when I need it for a dish. Neat…you are by far my best find and my favorite substitute in old family recipes. Nothing else can do what you do! So much love. So, for awhile now, I’ve been wanting to revamp another one of my mom’s famous recipes. Making it not only gluten-free, but also vegetarian. Oh…and dairy free too…but that’s pretty much a given when it comes to me, right? The actual dish is her delicious Cheeseburger Pie. Normally, the crust of this amazing meal is made from crescent rolls from the grocery store fridge area zone. You know, that place I hardly visit these days. But…then I got to thinking…what if I cooked up a pie crust and used that instead. Sure, it wouldn’t be the flaky crescent roll shell that this meal was known for, but I was already going to get rid of the whole meat thing (using a meat substitute) and use Daiya cheese for the cheese. So…why not give a different sort of crust a try? Cuisine Cube is run by a small group of foodies who have put together a completely gluten-free box of goodies and then sends them to your doorstep each month. These boxes contain 5-6 full-size products from small, lesser-known artisan producers…mostly local…some not as local. Some you may even have heard of before, but most will be new to you. I signed up for Cuisine Cube back in May and have never looked back. Subscriptions start as low as $29.99…which is a great price and great incentive to sign up for this subscription box service and try out some gluten-free products you have been too nervous about purchasing yourself or, perhaps, didn’t even know existed. Such as Moon Rabbit Foods. Never head of this brand before in my life. Moon Rabbit Foods follows a philosophy of choosing the finest ingredients and using the latest techniques of the craft of baking to give those living a gluten free lifestyle (like me!) a rare opportunity to enjoy delicious refined pastries and baked goods. Their baking and pastry blends provide a source for hard-to-find gluten-free products, allowing customers to enjoy that high quality at home, and even allowing them to add their own inspirational touches. So, here, in my clutches was a pie crust mix. I had no reason to make a pie. No one ever wants desserts at the family dinners. I usually do because I never really get to eat much of what is offered (part of why I love to host). But, I also hate being the only person to eat dessert, especially when I’m the one providing it. So, instead of going sweet, I opted to go savory and attempt to recreate a gluten-free, dairy-free, vegetarian version of my mom’s Cheeseburger Pie recipe. This mix makes 3 9-inch pie crusts. I went ahead and cooked them all up because…well…I could freeze the rest of them instead of just letting the mix sit and having to haul out all the equipment (a food processor, really) and ingredients (only 3) to do whenever I felt the need to make a pie. Because if I did that, it would only get used this one time. Therefore…all or nothing. So, I took 1 cup of the pie mix and mixed it with one stick (4 ounces) of butter (or vegan butter) and pulsed it until it looked like cornmeal. Then, in went 3 tablespoons of cold water and I ran the food processor until it all came together. I formed the dough into a 6-7 inch disk and then put it in the fridge for 30 minutes. Then I rolled it out and fit it into a pie pan. It fell apart at some points because pie crusts hate me, but I managed to get it into the pie pans and into a 350°F oven for 30 minutes. Out come the par baked crusts…and there you have it. Use it as you will. For the rest of the recipe, I used NEAT original mix and prepared the recipe from my mom’s cookbook as it would have been prepared regularly. YAY! That recipe will go in the review for NEAT. So stick with me here. Let’s talk about how the pie crusts cooked up and the rest of that important stuff. First of all, I think I sort of expected them to be a little more golden. They cooked, but they were still a pale white color. I poked it to make sure it wasn’t still dough. Then I figured it would get more golden as it cooked with my filling of Neat, tomato paste, onion, and vegan cheese…but it still remained a pale shade of…pale. It was cooked…it just didn’t look that way. It was a bit disconcerting. It tasted good though, so I guess that’s the important thing. It may look underdone, but it is quite a good pie shell. I was actually happy to have a pie crust that didn’t incorporate sugar into the mix as I was using it for a savory dish. This made this a great substitute for the refrigerated croissant rolls that used to make this light, flaky crust for this dish. Being a thinner crust also helped as well. So, once again, looks can be a wee bit deceiving. It’s all in the taste, when it all comes down to it. 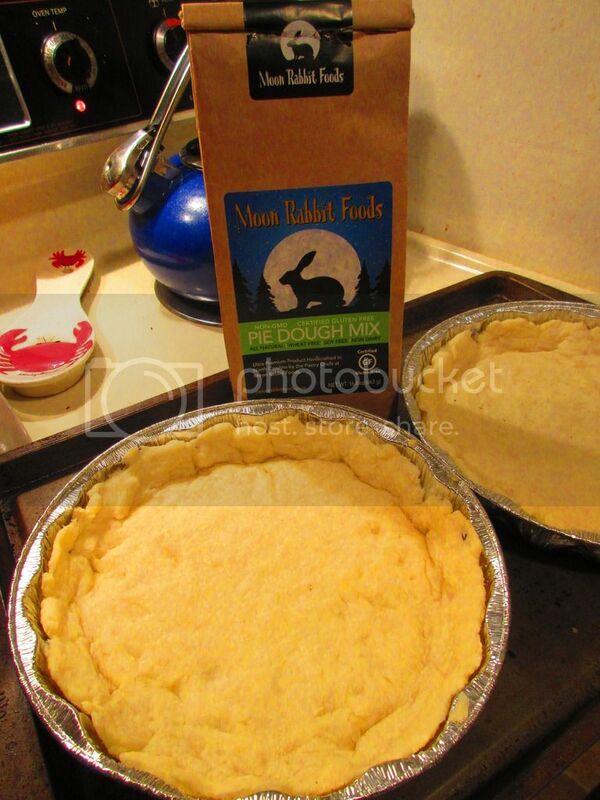 As for nutrition, the Moon Rabbit Foods Pastry & Pie Crust Mix has around 24 2 tablespoon servings in the package. A serving will provide 60 calories, 115 mg sodium, 16 grams carbohydrates, 1 gram fiber and no sugar or protein. No sugar or protein is added to the mix so…it remains that way in the end. When it’s prepared, all of this changes depending on your ingredients and the like. 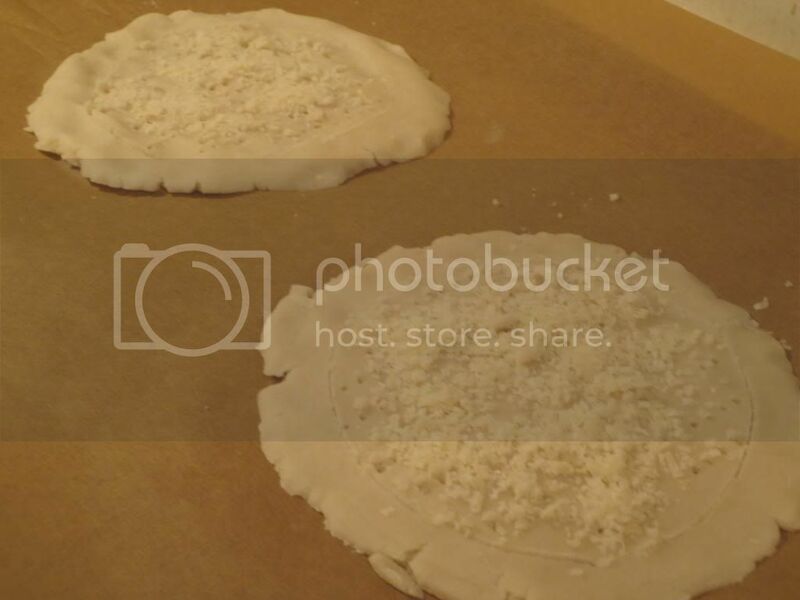 If you need an easy pie crust, I highly recommend Moon Rabbit Foods Pastry & Pie Crust. Yet another product I never would have even know existed (and, hence, never would have made my mom’s Cheeseburger Pie (albeit vegetarian and dairy free)) if not for Cuisine Cube. 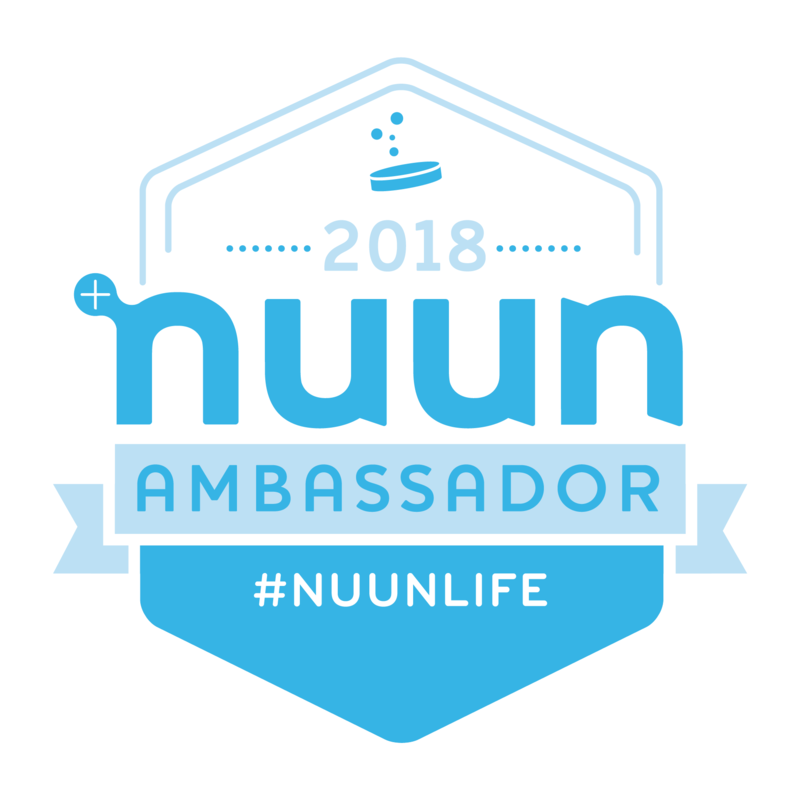 Loving this service and the new products and companies that it introduces to me. I had heard stories about these. Rumors. Whispers in the dark. Advertisements in my gluten-free magazines. I knew they were out there…the problem was I couldn’t find them. Anywhere. Pillsbury’s new line of gluten-free refrigerated mixes. Yes…Pillsbury. As in the Doughboy. Or…now…the Gluten-Free Doughboy. I was strolling through my local grocery store over the weekend. I was on a mission. Bananas for Tuesday’s after-I-work-out breakfast banana split. Honestly. But first I had to check out the manager’s special area. Usually Sunday is the day to do that. But not this week. But as I was striding past the refrigerator section holding the yogurts, the cheeses and the butters and margarine…I spotted these beautiful little containers that had that light violet color I saw in the ads. “OH MY GOD! OH MY GOD! OH MY GOD!” And then I took off. Which left my roommate watching me scurry over to the refrigerated space. She followed and I started picking up the three different items that the store had in stock. 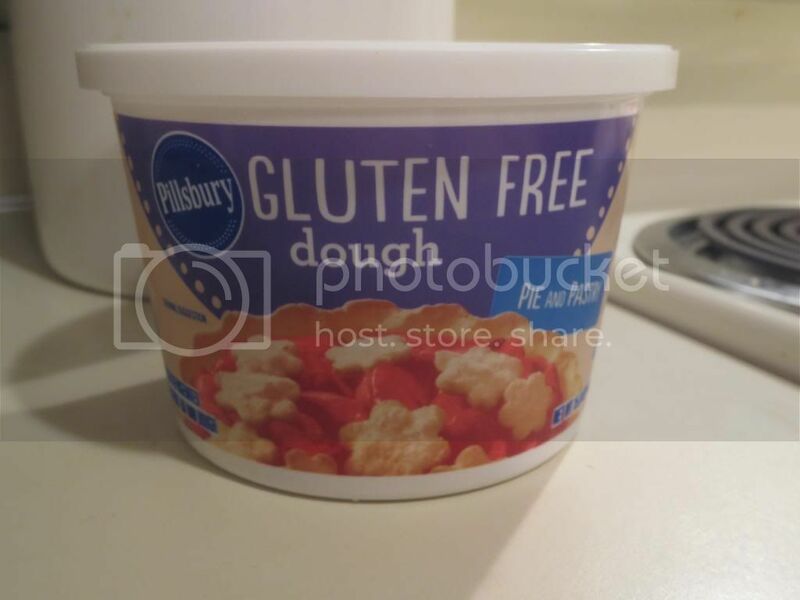 You see Pillsbury introduced three gluten-free doughs, pre-mixed and ready…very convenient. Gluten-Free Cookie Dough, Gluten-Free Pizza Crust Dough, and Gluten-Free Pie & Pastry Dough. I did this hillarious happy dance of joy, pumping my fists, doing a little jig and…turning to face my roomie and giving her the sad eyes that declare, “I really, really, really want these in my life!” We had plenty in our fridge, so she said maybe next week. I conceded, but my hand went back to the Pie & Pastry Dough. That was all I needed to say. The Pillsbury Gluten-Free Pie & Pastry Dough made its way into my hands to be taken to the register…along with the bananas, which was our original reason for shopping that afternoon. We paid, we went home, and this little tub of gluten-free joy went right into my refrigerator. And on Tuesday (Moday is fun run night…so that’s an easy food day), after a rough circuit training…it was time to see how this dough would do with the Tomato and Goat Cheese Tart that I used to make using puff pastry…you know…before I knew I had to go gluten-free. I knew that this dough wouldn’t puff up like a puff pastry, but I figured I could make it work. I basically followed the recipe for the tarts as I used to make them, substituting the puff pastry portion with a serving of this Pie & Pastry Dough. I scooped out a serving (56 grams) of dough and placed it on my lightly floured board. I floured my rolling pin and rolled the dough out to a six-inch circle (roughly). I repeated this with another serving, then plated them on the baking tray, gave a light sprinkle of Parmesan cheese, topped that with the onions I caramelized, a thick slice of tomato, a little salt, a little pepper, some goat cheese, fresh basil, and finally some shaved Parmesan. While the container has this baking at at a much lower temperature, I went with what my recipe had for the original tart with puff pastry. Into the oven at 425° F, I baked this for the 20-25 minutes, checking on it every now and again to make sure that it wasn’t burning. I was shocked that this actually worked. Honestly. But the tart came out beautifully. Sure, it didn’t puff up like it used to, but it didn’t need to. I served each of us one of the tarts and we settled in for dinner. My roommate dug right in, commenting on how she loved how the dough didn’t get soggy and how that it was still golden and flaky. I took that as a win as I took my fork and sliced into mine. She was right. This was the ultimate dough for the crust of my Tomato and Goat Cheese Tart. The dough itself baked into a perfectly golden crust, not turning soggy in the middle where the toppings were all stacked onto it. In fact, I was so pleased with the way this turned out. It had this beautiful crisp outside and this flaky texture. It was one of the most amazing things I managed to make with a gluten-free dough. I was in love with every bite. Every. Single. Bite. So, let’s talk ingredients and nutritional information. The not-so-fun part of this blog. But…it is important, because I value everything I put into this body. So, while it’s not always pretty, I like to be aware of what I am consuming. The Pillsbury Gluten-Free Pie & Pastry Dough is made from soybean oil, water, cornstarch, modified potato starch (BOO! ), hydrogenated soybean oil (BOO! 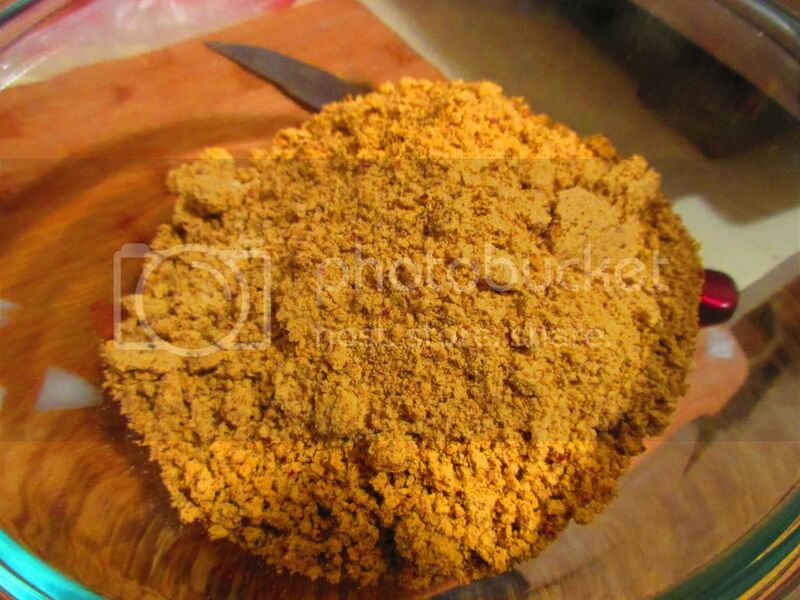 ), rice flour, whole sorghum flour, fructose, sugar, salt, xanthan gum, guar gum, citric acid, and some preservatives. So…yeah…clean eating it is not. But I made a deal to do at least 70%/30%…so I was going to allow this to fall into my 30%. Nutritionally speaking, a serving (56 grams) will bake you up a crispy golden serving of 250 calories and 17 grams of fat. So…yeah…it’s not a light dough by any means…but at least it tastes good. All things in moderation, my friends. That being said, the Pillsbury Gluten-Free Pie & Pastry Dough is cholesterol-free and has 340 mg sodium. This has 3 grams of sugar and less than 1 gram each of protein and fiber. That being said…using it as the base for my Tomato and Goat Cheese Tart worked out wonderfully. I just want to make that again and again and again. And I can, because I still have over half the dough in the container in my refrigerator. Squeak of gluten-free doughy glee! Honestly…the dough was perfect. I was afraid that it would just be mushy and unimpressive, but this was one of the most beautifully baked crusts I witnessed. Especially in the gluten-free crust world. I am so happy with Pillsbury right now…I could…just hug that little Doughboy. Nothing says lovin’ like somethin’ gluten-free from the oven. Pillsbury…I think I love you. The words gluten-free and ice cream sandwich are normally not found hand-in-hand. 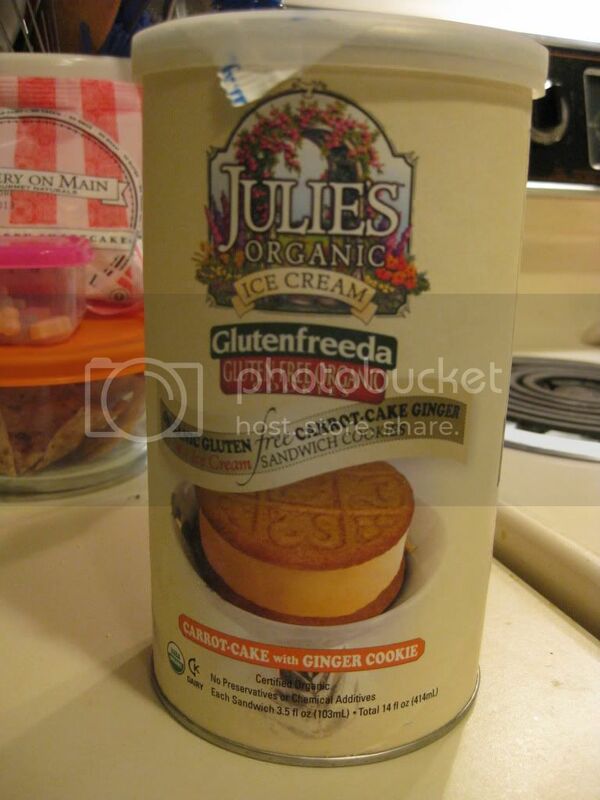 But thanks to the teaming up of Glutenfreeda (who provides the cookie portion of the ice cream sandwich) with Julie’s Organic Ice Cream…even the gluten-free can have a sweet taste of an ice cream sandwich. Even better…not being limited to just the chocolate cookies with the vanilla ice cream. While it is traditional and the most common, even in the ice cream sandwiches that are not gluten-free, Julie’s Organic Ice Cream offers up four different varieties of gluten-free ice cream sandwich cookies. And I have now had them all…with my final taste going to the Carrot Cake Ginger Ice Cream Sandwich Cookie. This one actually was the one that my roommate dreaded. She isn’t the biggest fan of carrot cake (unless I make it, she says) nor ginger…so she sort of put off eating this one until I just marched over to the freezer the other day when it was time for dessert and pulled these out. Her reaction, “Oh…we’re having those?” And picture this being said in the most unenthusiastic tone of voice one can conjure. She was really, really, really not happy that I made that decision. The Carrot Cake Ginger Ice Cream Sandwich Cookies are composed of ginger cookies made by Glutenfreeda that are soft and crumbly…like a pie crust. And the carrot cake ice cream is what fills these up and gives them their amazing combined flavor. I’ve never had carrot cake ice cream before, but if it always tastes like this…I want more of it in my life!! These ice cream sandwiches were SO delicious. My roommate took the first taste while I was snapping pictures for the blog (as I tend to do). And she says, “Oh…it tastes like a frozen pumpkin pie!” I finished taking pictures as she went to sit down and nosh on hers a bit more and took my first taste. She was absolutely correct. Forget carrot cake flavor, these really did taste like a frozen pumpkin pie. The ginger cookie gave the illusion of a crust and the ice cream was just super good. I loved the combination of flavors and how they would melt together on my tongue. The cookies are super soft, so that adds a crumbly consistency to them which sort of makes these more pie-like in the end. I found myself looking forward to dessert the next day…but dinner was taking forever to cook (naturally). But, anticipation is part of the fun, yes? And when we settled in to devour the final two in the package, we sadly big adieu to these ice cream sandwiches. Phenomenal flavor. I would totally buy these again in a heartbeat. Absolutely loved them. So, if you happen to be out at the store and looking for something different to try…whether you need to eat gluten-free or not…I highly recommend trying Julie’s Organic Carrot Cake Ginger Ice Cream Sandwich Cookies. It’s a slice of heavenly pie in ice cream form…and boy…is it ever delicious! When you name your company So Delicious, you are definitely setting a high standard for not only your branding, but also the products that you put out. So far, I have yet to have a flop with the So Delicious items that I have tried. I know…most of said products have been in a non-dairy ice cream form. My local grocery store had a great sale going on for the So Delicious quarts of ice cream awhile back. After sending my roommate out for an item I needed for something I was cooking, she returned with a huge surprise for me. Three quarts of So Delicious non-dairy ice creams to try. And since then, I have dug into the Chocolate Velvet and the Neapolitan flavors and fallen in love with each of them. All that remained in my freezer was the Creamy Vanilla one. I really wanted to dress this ice cream up. I mean, we all love vanilla ice cream…but it is so versatile. I was thinking of melting chocolate over it…or getting some chocolate syrup from the store…or topping it with fruit and nuts…or sandwiching it between two gluten-free cookies. The possibilities were endless. I mean, vanilla ice cream is like being handed a blank piece of paper and a pencil. You can get as creative with it as you want. Little did I know that in the end…I’d basically be enjoying it as it was made. Undressed. But…perfectly matched. 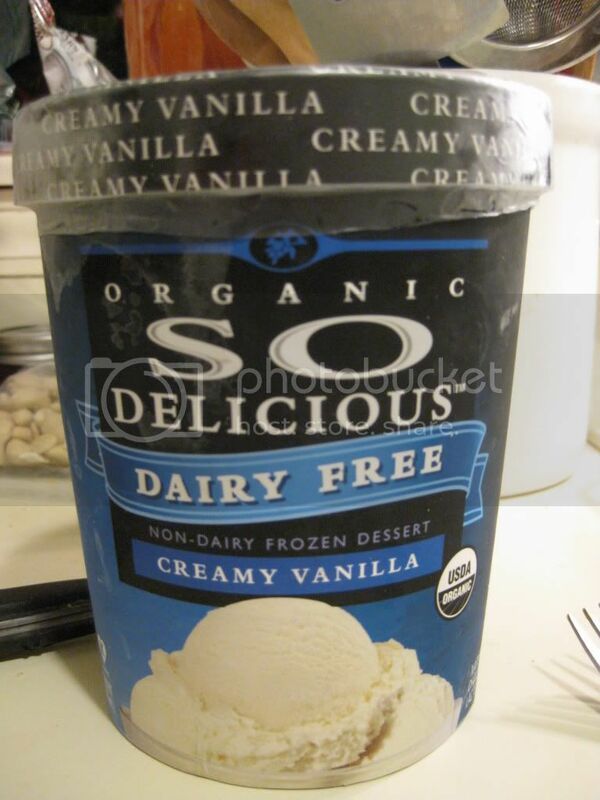 So Delicious Creamy Vanilla is a soy milk based ice cream that is vegan, kosher, and gluten-free. It is also non-GMO certified. YAY! That being said, this ice cream had been hanging in my freezer since the summer…so there was no way of telling what state I might find it in when I cracked it open last night. I almost expected freezer burn and ice crystals. But…I was wrong. When I pulled the lid off the quart, a beautiful white surface looked back at me. Perfect vanilla. And it smelled of vanilla too. So amazing. So, last night after hurrying through dinner in an attempt to make it out to a concert (The Dave Matthews Band was in town) on time, my roommate and I actually allowed ourselves a moment for a palate cleansing dessert. Never miss dessert. It is very important. I had thawed out the pie earlier that day so all I needed to do was toss it in the microwave (Gordon Ramsay would FLIP OUT!). While a tiny slice of pie was heating, I opened up the So Delicious Creamy Vanilla ice cream and got out a spoon. 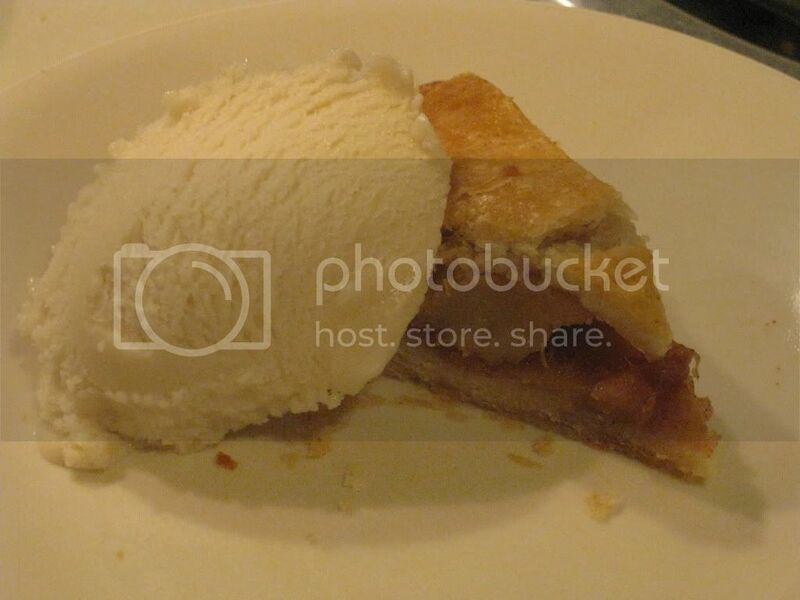 Apple pie à la mode is a slice of apple pie topped with vanilla ice cream. The warm pie melts the ice cream that is layered on top and what emerges is this amazing dessert that is both hot and cold and melty and yummy and…*DROOL*. Ahem. Sorry. Bit of a food nerd here. At least I’m a foodie who loves to eat (within my dietary restrictions that is!). So, when the microwave tolled it’s completion of the heating process, I removed the plate with the slice of pie resting on it and eased my spoon into the ice cream. Smooth. I expected something rock-hard, or flaky (some non-dairy ice creams can be crystallized and a bit hard to get a good, creamy scoop out of). But So Delicious really delivered here. The ice cream folded up in the spoon to create a perfect scoop. I set it alongside the pie (trust me, for calorie purposes, the serving size was halved and setting any ice cream on top of this itty-bitty slice was not an option). I repeated it with the other half of the slice and served one to my roommate and myself. First of all, having a delicious gluten-free pie is one thing. But the ice cream. Oh, the ice cream just totally made this dessert. I loved how it mixed perfectly with the buttery, flaky goodness of the pie crust, and the hot apples in the center just aided in creating this hot/cold, flaky/melty mess of a dessert. And it was everything I dreamed it would be. The So Delicious Creamy Vanilla won’t slap you in the face with its vanilla flavor. It is very subtle. That being said it is also very delicious. Trust me. I was highly impressed. I loved how it had just the right hit of vanilla flavor so that it wasn’t underwhelming or overwhelming. It was just perfect. I would buy this again in a heartbeat…and eat it straight. I might even still turn it into a sundae, or just put it in a gluten-free ice cream cone (I still have some of those in my pantry!). Being lactose intolerant and gluten free doesn’t have to mean ice cream is off limits. It just means you find an ice cream that suits you. Preferably one that is So Delicious.